Many decades before ‘Periyar’ E.V. Ramsamy launched his self-respect movement (1925) and propagated atheism, the erstwhile Madras presidency had seen a well-organised atheist-reformist movement (1878-88), which later faded into oblivion. The Hindu Free Thought Union, a movement launched in 1878, took inspiration from the London-based Anti-Church Movement of Charles Bradlaugh. In the middle of 1886, it was renamed Madras Secular Society (Chennai Loukeeka Sangam). “Now there is a need to rewrite the history of the reformist and atheist movement in Tamil Nadu. There is a strong case for shifting the focus of the movement from Bengal-centric perspective,” said V. Arasu, head of the department of Tamil, Madras University, who has traced the history of the movement and collected journals published by it. But, there is no information available as to who launched and ran the movement and why it suddenly disappeared. 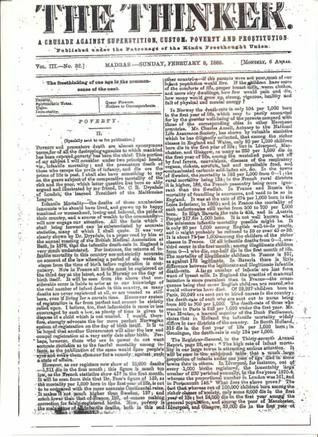 P. Munesawmy Naicker was the manager of the two journals run by the society and there are references to P. Appathoaray Chettiayar , identified as the secretary. One Masilamany Mudaliar had written extensively. “The journals, one in English and another in Tamil, advocated atheism, pro-labour policies, women’s education, widow-remarriage and strongly condemned the four-varna system,” said Dr. Arasu, who first came across ‘Thathuvavivesini,’ the Tamil journal, in the Prof Anbazhagan library in Anna Arivalayam. The English journal was called ‘The Thinker’. Through the journals the members of the society waged a relentless battle with the advocates of religion and god. While the free thinkers strongly opposed Vaishnavites, Saivites and Christians, they were equally critical of Theosophy, saying it was propagated by Brahmins. The journals carried articles on Western thinkers, including Thomas Paine, Spinoza, Voltaire and Ingersoll. The society also gave enormous attention to Darwin’s theory. It went on to ask: “When did ‘athma’ enter our brain? When we are in our mother’s womb or after we are born?” Nothing abusive or coarse. Prof Arasu said he collected some issues from V. Anaimuthu, a Periyar scholar, some as micro-film from Nehru Memorial Library in Delhi and some from Calcutta. He has already released the first volume of ‘Thathuvavivesini’ and ‘The Thinker’ and is working on four more.